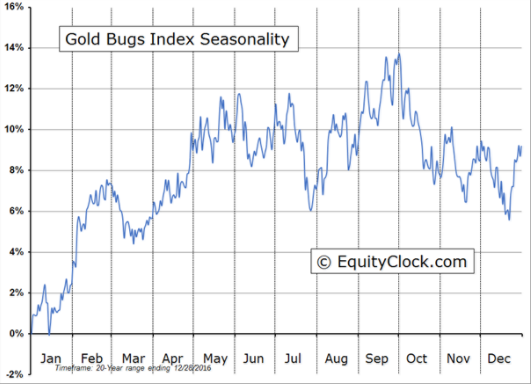 Gold Mining Stocks May Be Gearing Up For A Rally? 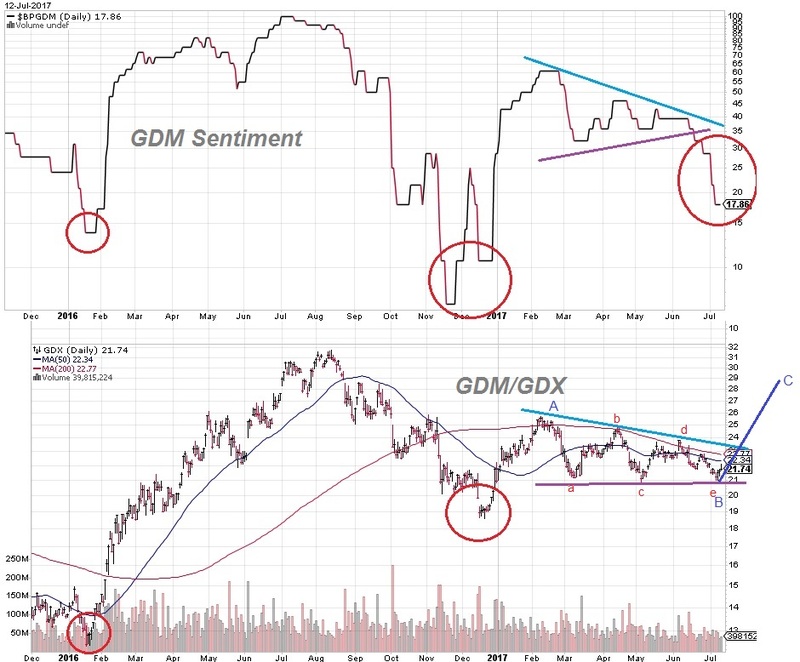 This chart shows the Gold Mining Sentiment (Stockcharts symbol $BPGDM) on top and the GDX ETF on the bottom. I highlighted the narrowing triangle pattern that has played out over most of 2017. The upper cyan line is consistent in both charts. But the lower purple line shows a severe divergence -- in fact the sentiment shows significant bearishness while GDX did not make lower-lows to reflect that deeper bearishness. The current GDM sentiment is 17.86 (updated with a 1 week delay.) Note that the initial 2016 low in sentiment (14) showed up in late-January while the GDX price bottomed out in mid-January. The current GDX started moving up on Monday this week, but because of the delay in reporting sentiment the chart does not show any change yet. This is not to say that the current bearish rout is over, because if you look at the period between October-December 2016 you can see October sentiment got down to 18 and that only represented in a short-term bounce. November sentiment reached a very low 7 reading, but the GDX low did not occur until late-December when sentiment plunged down to 11. So at the current 17.86 it is hard to say that clear skies are directly ahead for GDX. But the triangle pattern is a very strong pattern. A breakout, either way, will likely be a strong move in the direction of the breakout. It really looks like GDX 21 is a very powerful support level so it will take a very strong drop in gold/silver price to break through to the downside. Fortunately for the narrowing triangle pattern, a 10% move either way is about all it will take to confirm the breakout direction. 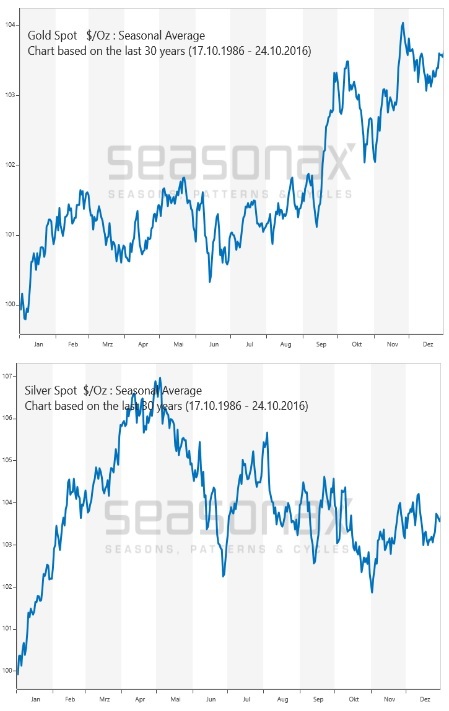 These seasonality charts show June as a significant mid-year low for gold and silver while the GDX chart shows late July. I am mildly confident that the breakout will be to the upside, so I have drawn what I believe is the most likely Elliott Wave pattern in play. The move up from Dec-2016 lows is "A" followed by a lower 5-wave a-b-c-d-e to end "B". So now wave "C" is in play that targets area just above 28. The end of most "e" waves are usually associated with extremely strong reverse moves. If that continues here, then the move up should be very strong -- the "A" wave move took 8 weeks, so this "C" wave could end in as few as 5-6 weeks. As always, the negation of this outlook will be if/when GDX breaks below 21 in a very strong move. Since the 21 level has been so stable for the past 4-5 months, a lot of stops are likely deployed in the area just below the purple line. Which means a break into that region could cause a sharp and nasty stop-run. In this event a downside target could reach as low as 14. On a very short-term view, the 60-minute charts for GDX, HUI, etc. all show a 3-wave move up from last Friday's intra-day low. As in classic Elliott Wave, the A and C waves are very close to equal in length. That is a sign of caution because if prices do not immediately break above todays "C" high then the entire rally of the past 3 days may be nothing more than a bear market rally. If we get an overnight rally in gold to at least 1225 and silver 16.05 then it is very possible to break these 3 up waves and form a more extensive impulsive pattern up from Friday's low that could propel gold, silver, GDX, etc. above their overhead resistance lines. On the other side of that breakout coin, the reason "e" waves often show a very strong counter-move is also because of stops that are likely deployed above the upper line of the triangle. In this case we should see a brief but explosive move upward if/when GDX exceeds the 23.10 area. Let's wait to see how wave "C" or the triangle breakout plays out before we start making plans about what may follow afterward.